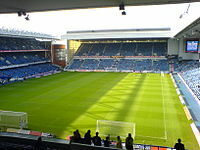 The 2006–07 Scottish Premier League season was the ninth season of the Scottish Premier League. It began on 29 July 2006. The league champions, Celtic and runners-up, Rangers, qualified for the UEFA Champions League on the return of Walter Smith as manager following a brief and disastrous reign by Frenchman Paul Le Guen. The team finishing third, Aberdeen qualified for the UEFA Cup, as did the Scottish Cup finalists Dunfermline Athletic. However, being the bottom-placed team in the SPL, Dunfermline were also relegated to the First Division. 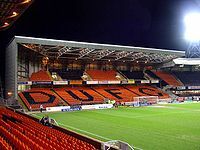 On 12 May 2007 Dunfermline Athletic were relegated to the First Division after a 2–1 defeat at Inverness CT and St Mirren came back from 2–0 down to win 3–2 at Motherwell. 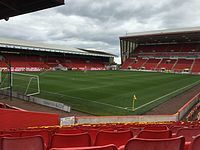 On 20 May 2007 Aberdeen beat Rangers 2–0 at home in their final game of the season to qualify for the UEFA Cup. For the second consecutive season, the top scorer was Kris Boyd of Rangers, with 20 goals. ^ As Celtic, the Scottish Cup winners, qualified for the Champions League via their league position, the place in the UEFA Cup was passed to Dunfermline Athletic, the cup runner-up. ^ "St Mirren Football Club". Scottish Professional Football League. Retrieved 4 November 2015. This page was last edited on 8 April 2019, at 00:46 (UTC).